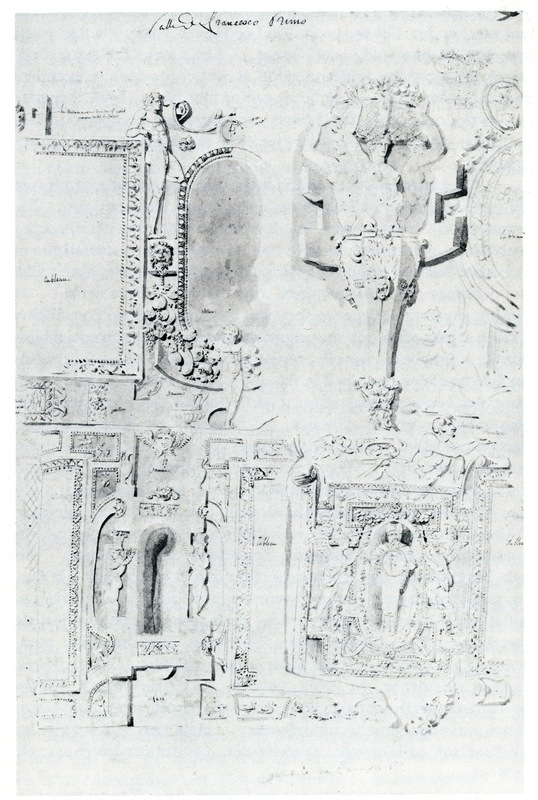 The central fresco: c. 1.69 x c. 2.50 m.
Pressouyre, “Restaurations,” 1972, 33, Fig. 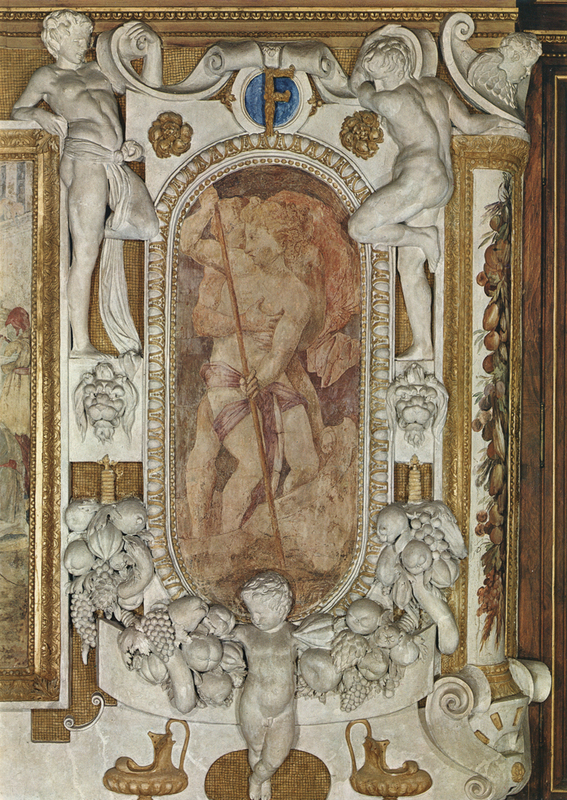 48, 34, pointed out that Percier’s drawing (see below) showing details of this wall indicates feigned marble which has not survived painted on the flat stucco surfaces beneath the central fresco (on which see also below in regard to the Vienna tapestry). PREPARATORY DRAWING: D.55 (COPY). Paris, Louvre, Inv. no. 8884, Unity of the State (D.55). 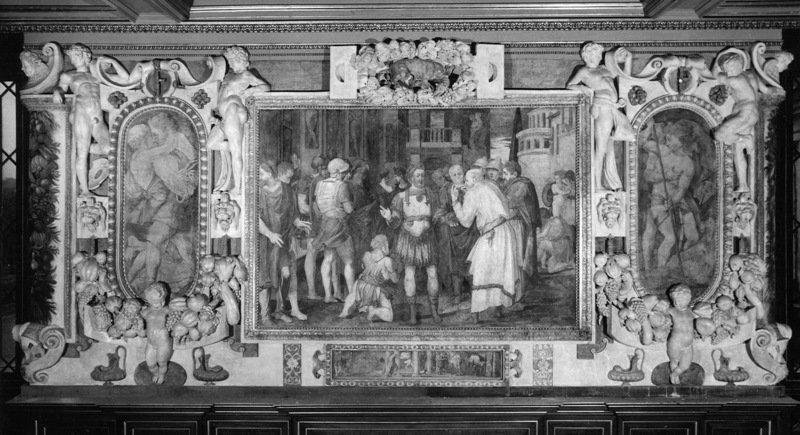 This drawing shows Rosso’s composition in the same direction as in the gallery but spatially opened up at the left and with the background not entirely shown. The proportions of the figures have been elongated and the figure at the far left is depicted briskly walking into the scene. A variety of details in the drawing – the lion’s head at the shoulder of the central figure, the costume of the kneeling figure, who looks like a child, the line of the hem of the garment of the figure in the right foreground – indicate that the drawing is not derived from the fresco. 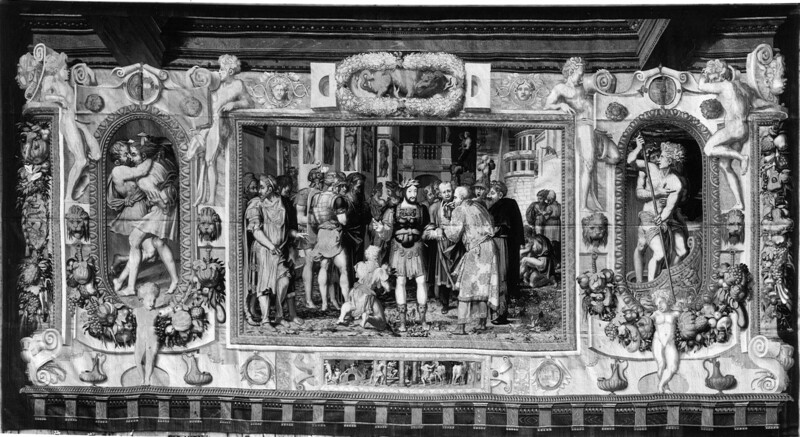 Nor is it dependent upon Fantuzzi’s etching (see below) or upon the Vienna tapestry (see below). The drawing would seem to be a somewhat free and incomplete copy of a lost drawing by Rosso, although it does not reflect his draughtsmanship. PRINTS: E.66. Fantuzzi, Unity of the State (E.66). 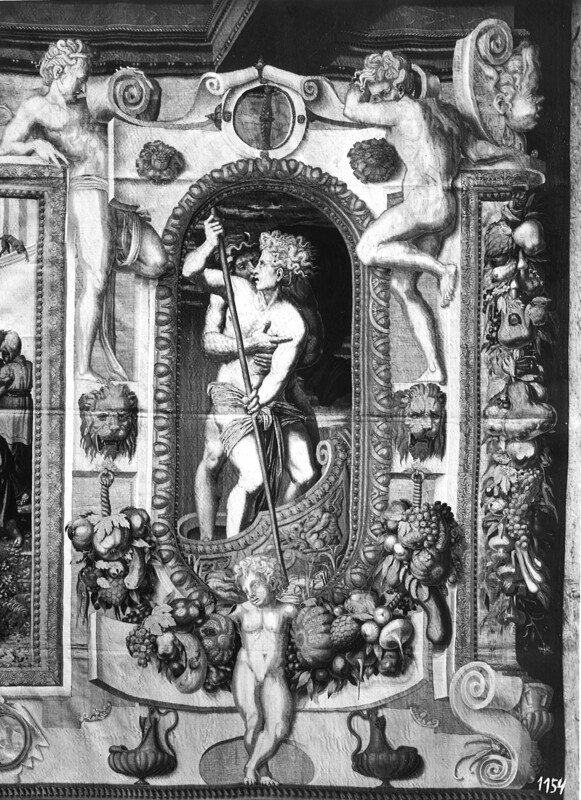 This etching is related, in reverse, to the central painting of this wall, although it is not a copy of the latter. Nor is it a copy of the Vienna tapestry (see below). But the print does have at least one detail that appears in the tapestry and not in the fresco: the lantern on the side of the building in the background. The central figure does not look like Francis I in the etching, two standing figures, the figure in a window, and the monkey on the ledge are missing from the left side of the print, the armor has been highly elaborated, the dwarf is dressed differently, and many of the heads have curly hair and beards. In the background the porch is enclosed by a wall and not by balusters. The etching is also slightly higher than the fresco. It is most probable that the print is derived from a lost drawing by Rosso that Fantuzzi has somewhat changed and enlivened. The one detail, the lantern, that appears again in the tapestry gives evidence of the use of Rosso’s drawings by the artists who made the tapestry cartoons. E.99. Master I. ♀. V., Frame (E.99). The side panels of this etching reflect a knowledge of the stucco decoration flanking the Unity of the State. However, the variations in the print are extensive. The standing male figures are related to the inner ones in the gallery and then are repeated in reverse at the sides of the print. But in the etching they all have wings. This detail could indicate that the print is based on a lost drawing by Rosso. However, most of what appears in the print along all of its edges and in the center is not derived from Rosso. COPY, DRAWING: Paris, Bibliothèque de l’Institute, ms. 1015, Vol. 2, fol. 4, sketch at upper left (Fig.Percier drawing 1). Charles Percier, Copy of part of the right side of the wall. Watercolor. “Galerie,” RdA, 1972, 33, Fig. 48, 34, 43, n. 46. The drawing of the late eighteenth century shows no differences from what appears in the gallery except for the indication of “peinture?” on the flat stucco band beneath the central picture and, possibly, the depiction of feigned marble there (see Pressouyre above). TAPESTRY: Vienna, Kunsthistorisches Museum, CV/6. 330 x 624. (For media, see below). This tapestry (Fig.P.22, VI S,Tapestry, a; Fig.P.22, VI S,Tapestry, b; Fig.P.22, VI S,Tapestry, c) reproduces, with some elaboration, the decoration of this wall. The stucco garlands have been colored. At the top at either side of the salamander there is a head framed with vines. A repair above the salamander may indicate that something has been removed (Pressouyre suggested a crown), although nothing appears here in the gallery. Beneath the ends of the central picture there are colored medallions set within drapery; there are no traces of such medallions in the gallery although Percier’s drawing (see above) indicates painting here and possibly the depiction of marble. But there is not really enough room here in the gallery for the round medallions of the tapestries. 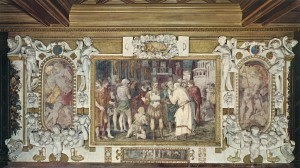 The central picture has an extra figure in the foreground at the far left. In the central scene the kneeling blond youth wears a pink tunic with gold fringe and a blue sash shot with gold. Francis I wears a green wreath on his brown hair. The main body of his cuirass is wine red and gold with a green and yellow sash around it. The flaps of his cuirass are lavender and gold falling over a green skirt fringed with gold. His legs are white, his boots tan. He also wears a blue cape. The nine figures standing to the left of Francis I are dressed in the following colors: 1. a dark pink hood and cape; 2. a yellow green cloak turning to red at the edges, with a blue undergarment visible beneath his sleeve; he wears tan leggings; 3. a green and dark blue cloak with tan fringe; 4. olive armour and a tan helmet with a pink feather; 5. a bronze green cuirass and helmet touched with gold, a wine red undergarment sleeve, a light blue sash, and a green and olive green skirt; 6. a tan helmet; 7. a dark lavender-pink cloak over dark blue and a dark blue and gold undergarment; 8. (in the distance and seen from the back) a dark orange tan cloak; 9. (in the distance and seen from the front) a green and olive dress with green and pink ribbons in her hair. The eight figures to the right of Francis I are dressed in the following colors: 1. (very little visible) olive; 2. (very little visible) dark red; 3. a green cloak over a dark red garment visible at the neck and as leggings; he has brown shoes; 4. an olive green and dark blue helmet with pink feathers; 5. a tan to pink cloak with large patterns in gold; a pink sash and skirt with some blue; 6. an ochre helment with a blue sheen; 7. an ochre and gold helmet with yellow, pink, and lavender feathers; 8. a wine red cloak over a dark blue tunic, pink leggings with a blue pattern, and red shoes; he has a green band around his head. At the far right the kneeling man wears a blue tunic with a brown belt. The figures behind him are tan and gray. Going up the stairs in the center background are two woman, the first wearing green with a blue hat, the second dressed in red. In the oval scene left of the central picture the two figures appear standing on two curved gray marble slabs flecked with blue, red, pink, and white. The left figure wears a yellow-green garment shot with gold thread. His companion has an orange-tan garment turning to lighter tone of the same color and then to gray. In the oval scene at the right the front figure wears pink drapery shot with gold; the back figure has wine red drapery flying to the right and ribbons of the same color in his hair. At the top of the tapestry the “stucco” garland around the salamander is tied with blue ribbons.